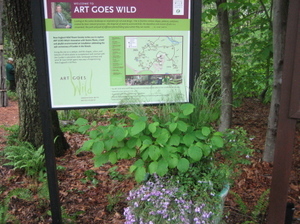 Art Goes Wild, a new exhibit at the Garden in the Woods, celebrates the 75th anniversary of the garden. Landscape Architect W. Gary Smith has designed a series of installations that use native plants in new and different ways. The exhibits will be in place until the garden closes at the end of October, and many of them will grow and change as the season progresses. Last week, Gary was kind enough to conduct a tour for the volunteer guides to explain his thoughts about the exhibit and answer some of the questions we thought visitors might have. 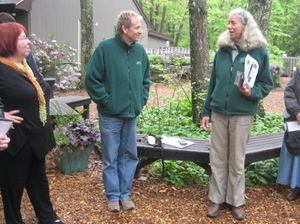 Here is Gary with marketing director Debra Strick and volunteer coordinator Bonnie Drexler. 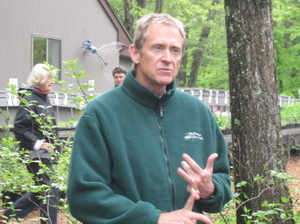 Gary has done a lot of design work with native plants, most notably Pierces Woods at Longwood Gardens. He explained that in his work he tries to go beyond the traditional naturalistic design and create artistic works that are creative, abstract, or formal. 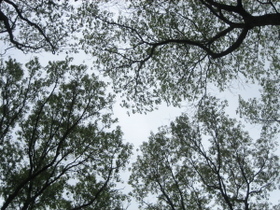 He likes to play off the basic shapes of nature, such as radial, spiral, serpentine, scatter, mosaic, and natural drift. One goal of the exhibit is to show people that they can use native plants in innovative ways while still maintaining the ecological benefits of native plants. He explained that many of the ideas had started with rough sketches, which were brought to life by the collaborative work of the garden staff and volunteers. In some cases, the final form of the piece changed as it was implemented. This quote from Gary is on the opening sign: "Looking at the native landscape as inspiration for art and design, I like to find the intrinsic shapes, patterns, and forms created by basic natural processes - the dispersal of seeds by wind and birds, the deposition and erosion of soils in a streambed, the push and pull of different plants finding space where they can coexist." The exhibit has some really great signage. On each sign, there are pictures of the plants which inspired the design concept, along with pictures taken during the construction. There's a quote from Gary Smith and a reproduction of his original concept sketch, a list of the plant materials, an ecological note, and a variety of other information. There's also an accompanying take-home plant list, listing all the plants used in each segment. 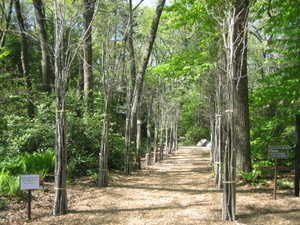 The Beech Colonnade is a strong architectural form that frames the entry to the garden. It is in contrast with a natural beech grove just off to the right of this picture. The colonnade uses repetition and forced perspective to frame the views of the natural woodland beds of spring ephemerals on each side. The original concept was to have more formal upright columns. But when assembling the bundles, it seemed better to leave some of the upper branches that now form a sort of archway over the path. 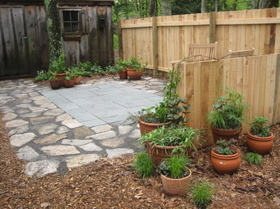 The Idea Garden is an illustration of how native plants can be used in the home garden. 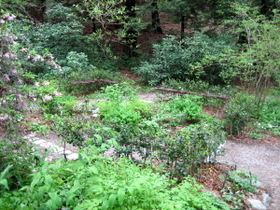 This section will become a permanent part of the Garden in the Woods in future years. The centerpiece is a sedge lawn of Carex pensylvania, which is recommended as a low maintenance feature where shade makes it difficult to grow a traditional grass lawn. 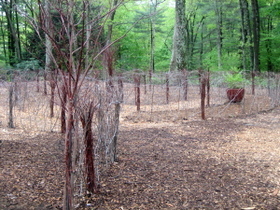 The sedge lawn is enclosed by belgian blocks and a low woven fence made of red- and yellow-twig dogwood branches. 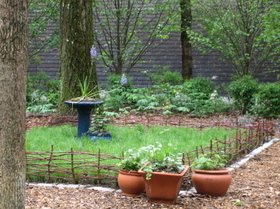 This illustrates another theme of Art Goes Wild, which is the reuse of natural garden materials to make garden features. 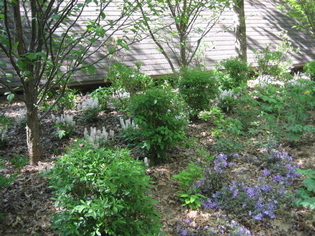 The patio shows the use of native plants in clustered containers (hanging plants will also be added soon), and behind the sedge lawn is a mixed border of white- and blue-flowering native plants within an enclosing curve of birch trees. 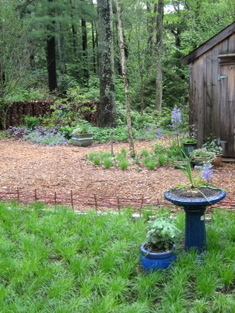 It really shows that you can have an amazing native plant garden, even if you only have a very small area. At the back left in the last picture, you can catch a glimpse of a creative serpentine privacy wall made from fallen leaves stacked within wire-mesh cylinders. Best to quote Gary on this one: "My vision here is to call attention to the organic mosaic of woodland wildflowers by inserting a simple square frame". 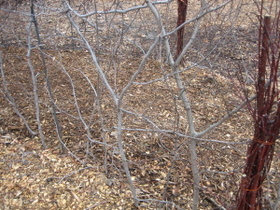 In this case, the frame is a hedge of American holly (Ilex opaca) lined with horizontal garland of beech twigs. 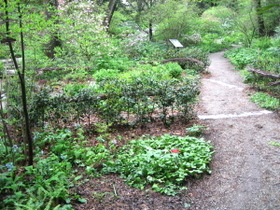 The square form of the hedge is carried across the path by inlaid stone blocks. This piece is not completed yet. 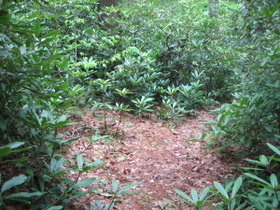 The idea is to form a garden room, a simple circular space, within the grove of rhododendrons. A circular bench will be installed. End of Part 1. See Part 2 for more, including Floating Gardens, Yin-Yang, Flying Saucers, Hidden Valley, and Gathering of Grass. You remind me of my grandfather who is also busy with his own garden. It’s just in their backyard but I presume that if it’s somewhere wider, my grandpa will have lots of beautiful stuff to add. For instance, he has these twigs project, too. The dried twigs of some small plants were shaped into deers. There are I think two deers made from twigs and they’re in a middle of a group of bonsai plants arranged in a circular manner. Twigs were also shaped into little butterflies and these were put in a section where orchids are grown. Every time I visit my grandpa we would always have bread and strawberry jam in his garden. Our favorite part is where there ornamental plants consist of white roses. Grandpa knows how I fancy a boyfriend who will give me white roses on every special occasion. How lovely! I can't wait for the other parts... and I adore the colonnade and the woodland parterre in Part I. Your blog was very useful to me. I live in Usa-shi in the south in Japan. Please see the yard which I made ( http://iyasaka.blogspot.com/ ).